Celebrate Messiah Australia was officially born on the 24th of January 1995. I still remember the day when my wife Louise and I were driving in the car together with our son Asher who was five years old at the time. 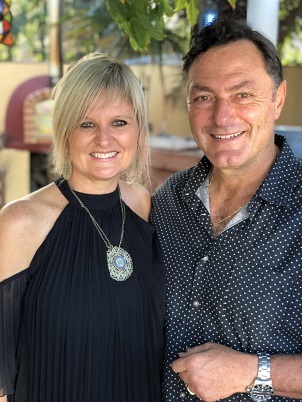 We had just come back from five years of mission work amongst Jewish people in Johannesburg South Africa and we were trying to think of a name for the new mission here in Australia. We were singing along to Jonathan Settel’s song Celebrate Messiah when all of a sudden, almost in unison, we cried out; Celebrate Messiah, we should call the ministry Celebrate Messiah. Soon after the birth of Celebrate Messiah we hosted our very first Shabbat outreach in South Melbourne on the 3rd of February 1995. The first Celebrate Messiah office was in our home in Hawthorn West and Gavin Brown and I launched into ministry while working part-time to support ourselves. Thanks to the prayers of faithful friends who truly believed in our vision right from the start, God blessed the ministry and before the end of that first year, both Gavin and I were working full-time in reaching out to Jewish People in Melbourne. Some of you, our faithful supporters, have been with this mission from the very beginning. I can’t express enough my gratitude to you for standing with us and believing in the need to bring the Message to the original messengers. You have been the foundations of this ministry and may the Lord truly bless you. In October 1998 Beit HaMashiach (House of Messiah) Messianic Congregation was officially established and the congregation took up ministry in the heart of the Jewish community of Melbourne, Caulfield a suburb that had seen a sharp decline in Christian witness for a number of decades. A messianic Jewish presence in the holy land was not appreciated by the Jewish community and not long after moving into Caulfield we started experiencing quite serious opposition both in written propaganda and in vandalism to our building. I believe that the increased opposition was a response to a mini-revival that was happening amongst Russian speaking Jews who were now resident in Melbourne (approx. 25,000 Jews from the former Soviet Union in Melbourne). Over a period of a few years we saw more than 300 Jewish people come to faith in Yeshua as Messiah. This was nothing short of an unprecedented move of God in Australia amongst Russian speaking Jews that was parallel with what God was doing amongst Russian Jews in other parts of the world like the USA and Israel. Still today hardly a week goes by in Melbourne without a Russian Jewish person praying to receive Yeshua as Messiah. Celebrate Messiah joined in partnership with Chosen People Global Ministries in the year 2000. Chosen People is a New York based ministry to the Jewish People that was established in 1894 when Rabbi Leopold Cohn came to faith in Yeshua. Chosen People Ministries today is led by Dr Mitch Glaser. Mitch was the one who encouraged me as a new believer in 1984 and then later he recruited my wife Louise and I into Jewish ministry. He and his lovely wife Zhava have been close friends ever since. It is certainly a great privilege to serve together with Chosen People Global Ministries in 13 countries around the world. In September 2004 God led Celebrate Messiah to pioneer an outreach to the forgotten Jews of the Far East of Russia with the main thrust of the work in Jewish Autonomous Region in the city of Birobidzhan. Today we have seen God bless this ministry beyond our expectations and eight messianic outreaches have been established across the Far East Russia region including parts of Siberia. We often return to Russia to continue planting messianic outreaches not only in the Far East of Russia and Siberia but our mission trip also includes the Ural mountain area. Today by God’s grace and blessings and your faithful support, we now have nine full time outreach workers and a host of volunteers across 4 countries; Australia, New Zealand, Russia and of course, Israel. In Australia, our Sydney team is also developing an outreach to Jewish people in the Northern suburbs that is going very well. We are very grateful to the Lord for all that he is doing through the ministry at this time. Your partnership, prayers and support is vital to the ongoing mission of Celebrate Messiah. Thank you so much for standing with our mission to the Jewish people. Our testimony over these seventeen years is that God has blessed us as we have worked to bring the Message to the Original Messengers and to see God’s Chosen People fully restored through faith in Yeshua HaMashiach Jesus the Messiah. Thank you so much for your prayerful support over these many years.